If you’re looking to liven up blank, boring dorm walls, then I have juuusssst the thing for you. It’s these “Dorm Sweet Dorm” art prints – talk about are an easy way to decorate your space! Thanks to them being printable, you can skip spending hours cross stitching the phrase to make your dorm feel more homey. Let’s face it, most college students don’t even have the luxury of having that much extra time to spend on such a project anyways. 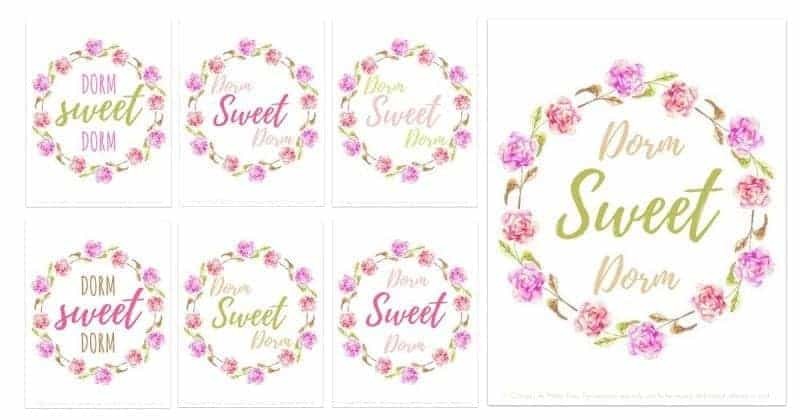 Adorning your walls with this clever play on the classic “Home Sweet Home” saying is as simple as printing and framing. SO easy! It’s FREE and it comes in 7 slightly different variations. Each design is available in both portrait and landscape layouts, so there’s something to fit everyone’s tastes. A tip I have for you to keep this little project on the inexpensive side, is to use a frame from the dollar store – yep they have those, too! This is the epitome of decorating on a budget. ? Print them all and share with friends, or print one and make your dorm the coolest one on the floor (okay, I might be exaggerating a little here). Either way, it’s up to you to decide what you want to do with these prints. Don’t forget to share with me what you come up with on Instagram @collegelifemadeasy. I LOVE to see other’s getting use out my designs. 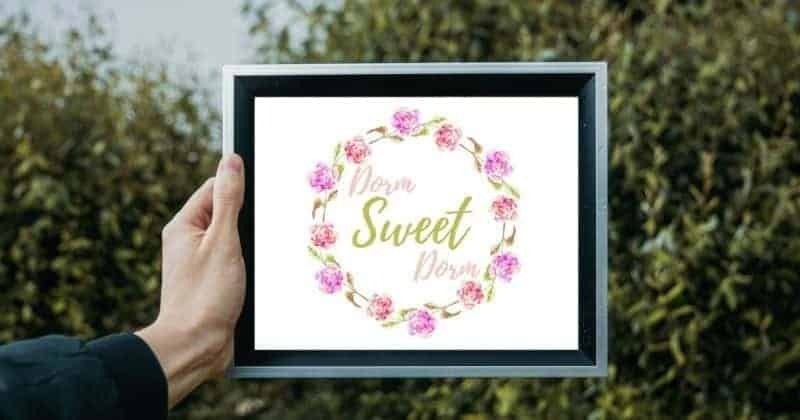 Are you interested in printing this “Dorm Sweet Dorm” wall art? Let me tell you where to get it! monthly budget worksheets (one of my most popular printables). The resource library is password protected, and to get that password you’ll just need to be an email subscriber. …I send helpful emails about twice a month that focus on topics about college, saving money and organization. Alright that’s everything I have to say about these dorm decor art prints, happy printing! And again, I would SO be interested in seeing what it looks like in your room – don’t be shy about sharing with me on social media. I don’t bite! ? 2. You’ll first get an email making sure that you DO in fact want to receive emails, click “confirm”. 2. Then you’ll receive a 2nd email with a link to the Free Printable Resource Library + the password. 3. 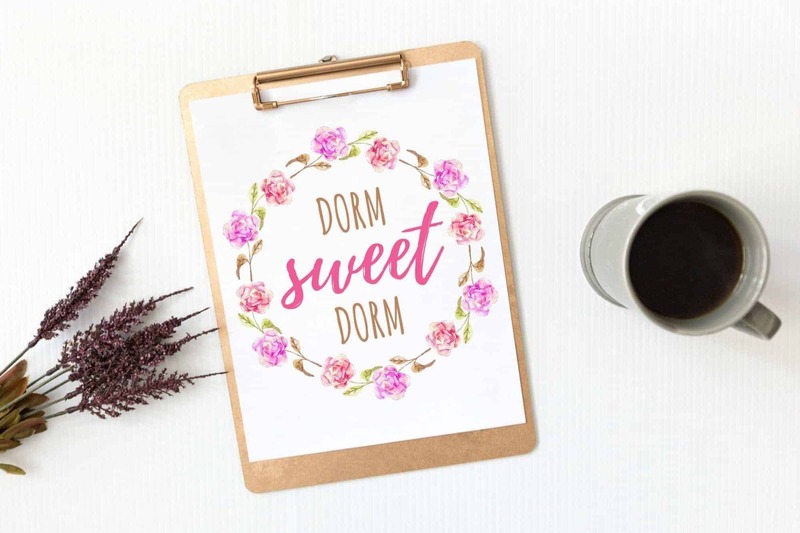 Use that password to gain access to the “Dorm Sweet Dorm” printable wall art and 20+ other printables. 4. To download, simply click on the picture! Let me know what you think of these, it would be great to hear your thoughts on them!